Update the BIOS on your computer only if the newer BIOS version specifically solves a problem you have. We do not recommend BIOS updates for computers that do not need it. View all BIOS changes in the release notes included on the BIOS download page in Download Center. Downgrading the BIOS to an earlier version is not recommended and may not be supported. An earlier BIOS version may not contain the support for the latest processors, bug fixes, critical security updates, or support the latest board revisions currently manufactured. Before initiating a BIOS update, read and precisely follow the instructions included in this document. You may want to print the instructions for easy reference. If a BIOS update process is interrupted, your computer may not function properly. We recommend performing the process in an environment with a steady power supply (preferably with Uninterruptible Power Supply). Before updating the BIOS on the Intel® Desktop Board, manually record all BIOS settings that you changed (from default) so they can be restored after completing the BIOS update. All images in this example are for illustration purposes only. You need to select the correct BIOS files for your board. In the unlikely event that a BIOS update is interrupted, it's possible the BIOS may be left in an unusable state. The recovery process requires the chassis to be opened to move the onboard BIOS Configuration Jumper. All BIOS update files for Intel® Desktop Boards are available at the Download Center. This process is intended to be performed by a trained technician. Use this method if the recovery file (*.BIO) is too large to fit on a diskette, or the desktop board does not include diskette drive support. 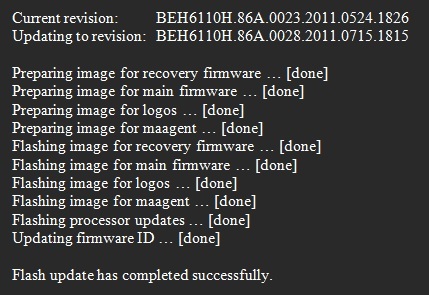 Download and save the Recovery BIOS file to a temporary directory. Copy the recovery file (*.BIO) to a USB device. Plug the device into a USB port of the target computer. Shut down the computer and unplug the AC power adapter. Open the chassis and remove the BIOS Configuration Jumper. See the Technical Product Specification for details including the location of this jumper. Wait 2–5 minutes for the update to complete. The computer turns off when the recovery process is completed, or prompts you to turn it off. Replace the BIOS Configuration Jumper (image 2 above). Use this method if the recovery file (*.BIO) is small enough to fit on a diskette (smaller than 1.44 MB) and the desktop board includes diskette drive support. Note The diskette does NOT need to be bootable; however, it must be formatted. Copy the recovery file (*.BIO) to a formatted diskette. Place the diskette in the diskette drive (drive A) of the target computer. Wait 2–5 minutes for the update to complete. When the drive LED is lit, the computer is copying the recovery code into the FLASH device. Remove diskette from drive A. Use this method if the recovery file (*.BIO) is too large to fit on a diskette or if the desktop board does not include diskette drive support. Copy the recovery file (*.BIO) to a CD. Place the CD in the CD-ROM drive of the target computer. Open the chassis and remove the BIOS Configuration Jumper (Image 1 below). See the Technical Product Specification for details including the location of this jumper. This article applies to 164 products.